Second largest city in Croatia and largest city in Dalmatia is a great place to visit and to experience and see Dalmatian life as it truly was in the past and as it is now. The ancient town is a great blend of ancient and modern city, always buzzing and it has great balance of modern style of life and a traditional style. 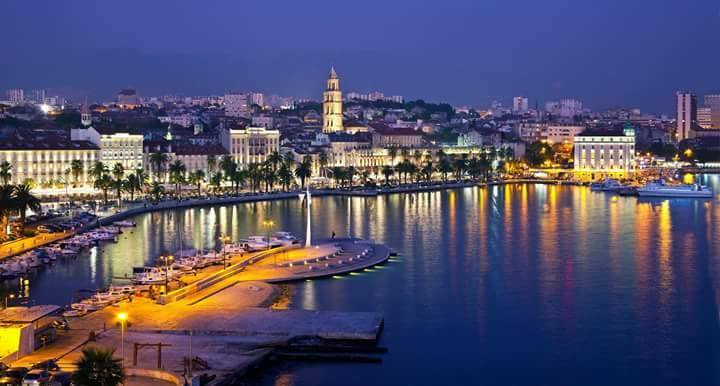 The setting and location of the Split will leave you breathless, especially if you are coming to Split from Zagreb (from highway), as you will entering the city by modern motorway from the north side of the town you will see glorious view of the city from the slopes of the Mosor mountain. Center of the city is an old Diocletian’s Palace, one of the world’s greatest and most impressive Roman monuments and a Unesco World Heritage site, which he built 1700 years ago and from where he ruled the Roman Empire. Is is beautiful to see how modern city is blended into almost 2000 years old wall and monuments. Diocletian’s Palace and surrounding monuments like Cathedral of St Domnius are site that must be seen if you are visiting Split. If you are fan of good entertainment and time than ULTRA Europe, festival of electronic music is one that you must not miss. It is held on mythical city stadium “Poljud” and it attracts more than 150 000 visitors during the 3 days every year in July. And while we are mentioning football stadium great thing is to visit one of the matches of football club Hajduk Split is you are fan of sports and football. While you are in Split you should definitely visit Marjan forest park which is located near the city center, and ancient town Salona (today Solin) which had more than 60 000 inhabitants in the 1st century A.D.